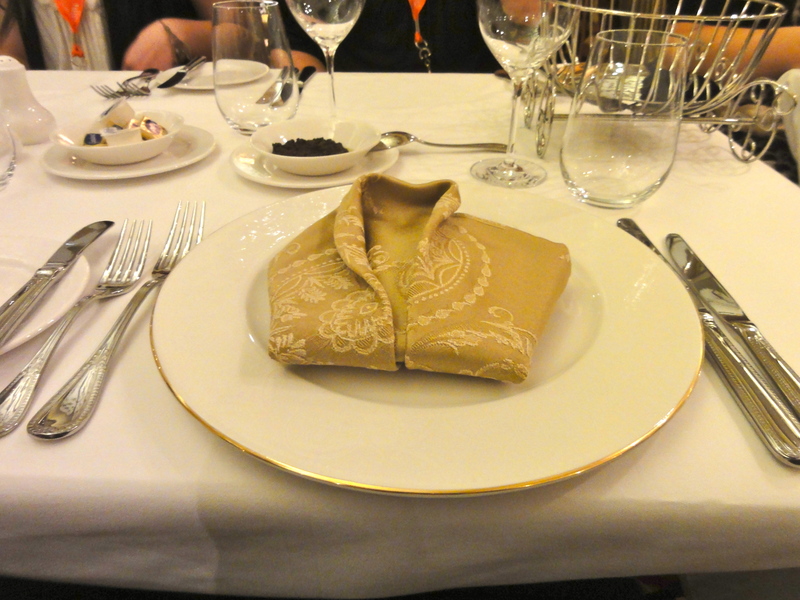 Disney Fantasy Christening Gala – Part 2 The Food! Yes, there has been a ton of coverage of the Disney Fantasy Christening Celebration from March 1, 2012. It was a star-studded evening, and the Fantasy is an amazingly beautiful ship. In fact, you can read my coverage here, in Part 1. But I haven’t seen much about the food. And that’s a shame, because the food was VERY good. 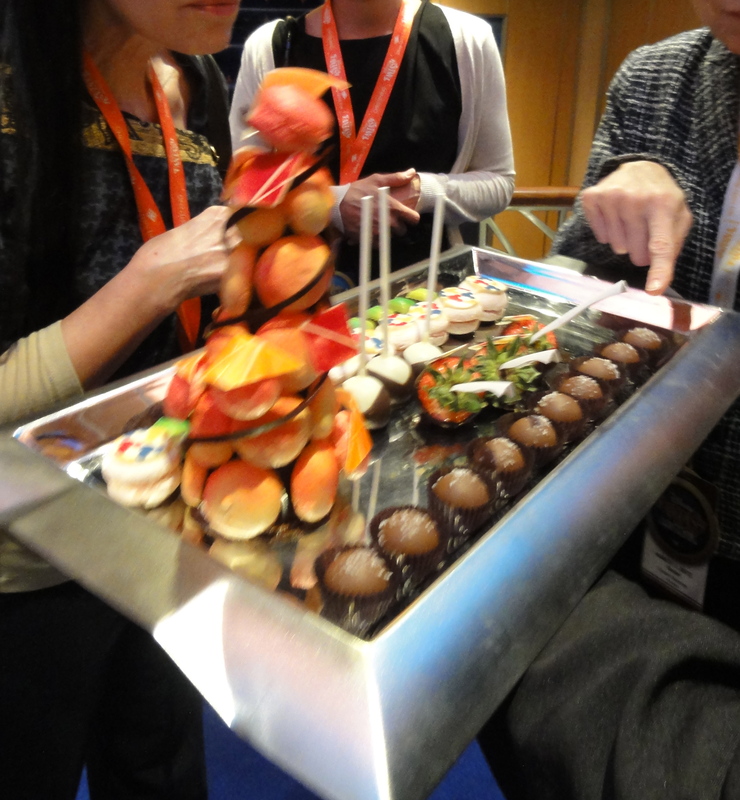 And as any cruiser knows, half of the fun of cruising is eating. (At least, that’s what I’ve been told.) So here you go – a recap of what we ate, and how it was. 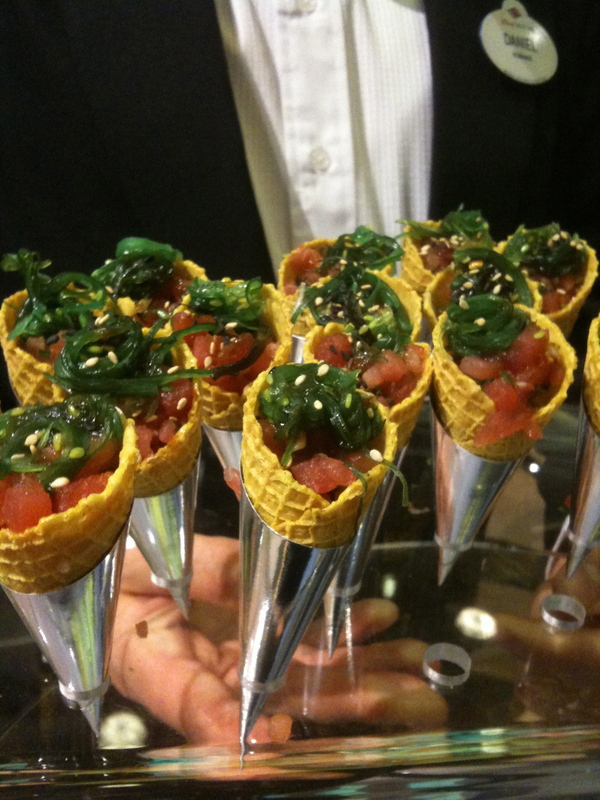 First up, we had a variety of passed hors d’oeuvres at the cocktail reception. Sorry for the blurry pics – I was juggling my purse, camera and champagne, while attempting to tweet live on my iPhone and taste the food. I could have used another three hands. 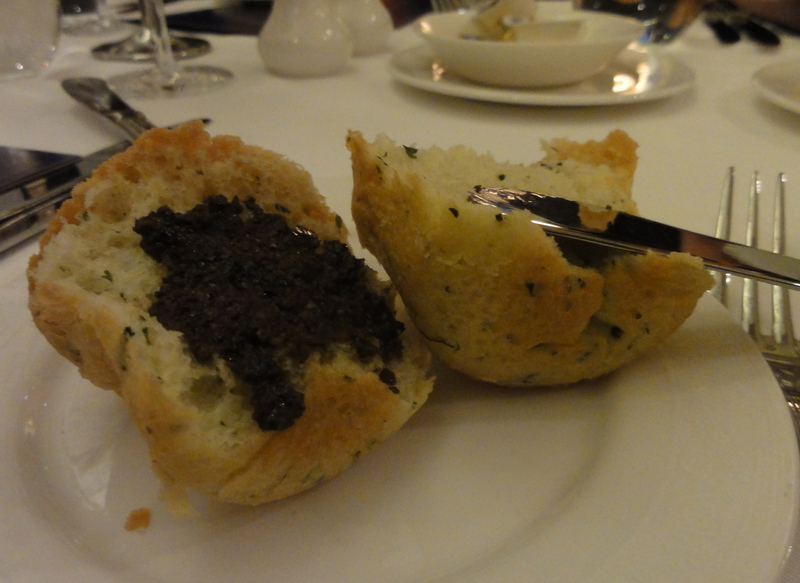 Then the bread was delivered – warm herbed brioche, with olive spread. The spread was a little too mild for my taste, but the bread was very nice. All three were very nicely done. 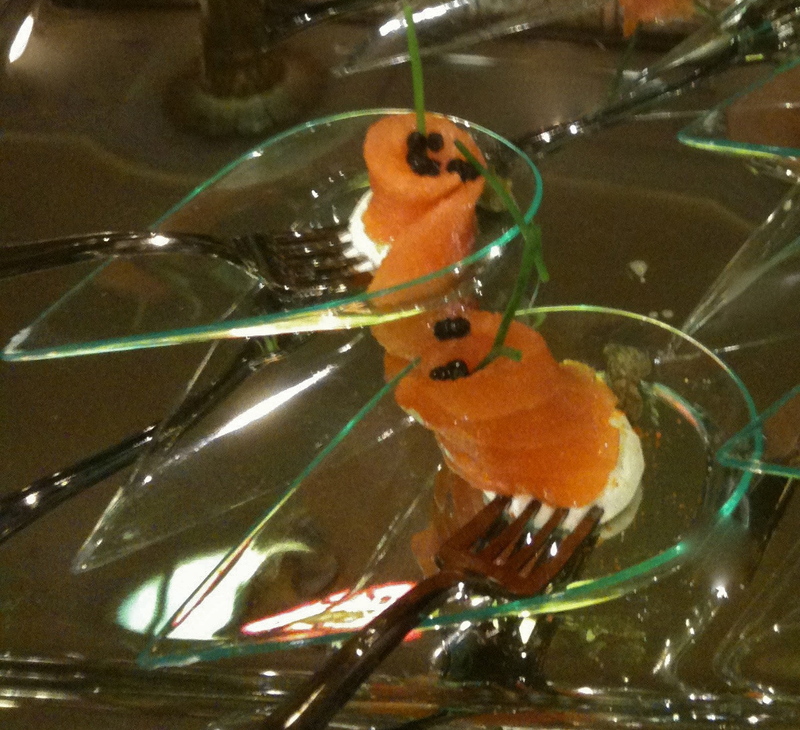 I think my favorite was the lobster and shrimp, probably because I hadn’t had it already in the form of an hors d’oeuvre. Besides, I like how the asparagus is like a little arrow. 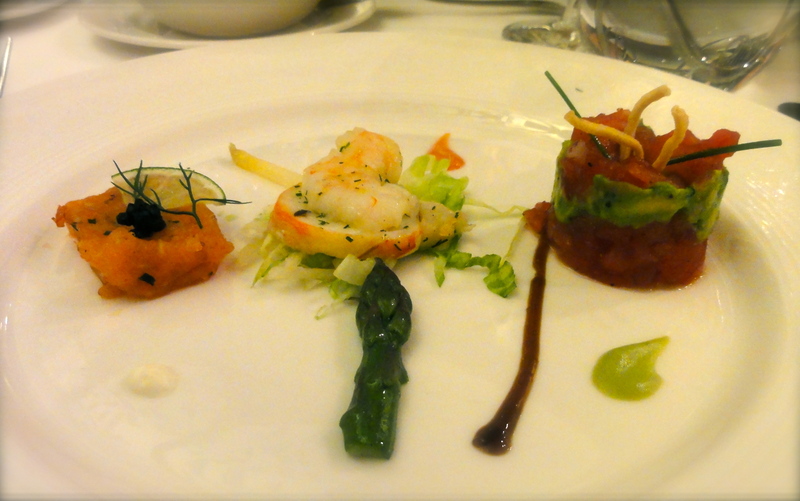 Moving on to the entrees, there was again a selection from three of the restaurants. Our table tried four of the five options – all but the vegan. 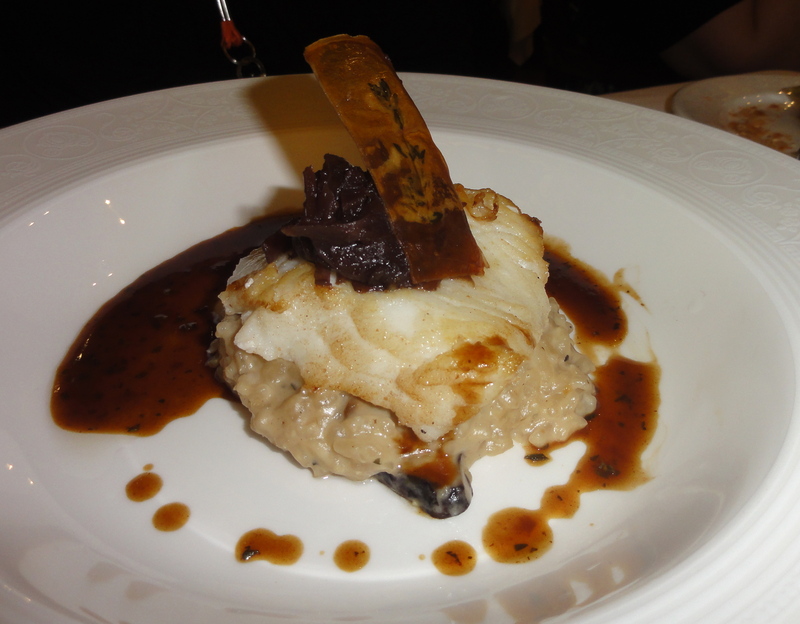 First, from Enchanted Garden, the Pan-Seared Sea Bass with a Mushroom Herb Risotto, sweet Onion Marmalade and garnished with a Potato Crisp. The fish had a really nice seared crust, and the risotto was delicious. I’m not sure the textures were totally right together, and the risotto was a little thicker than I like, but that’s just splitting hairs. 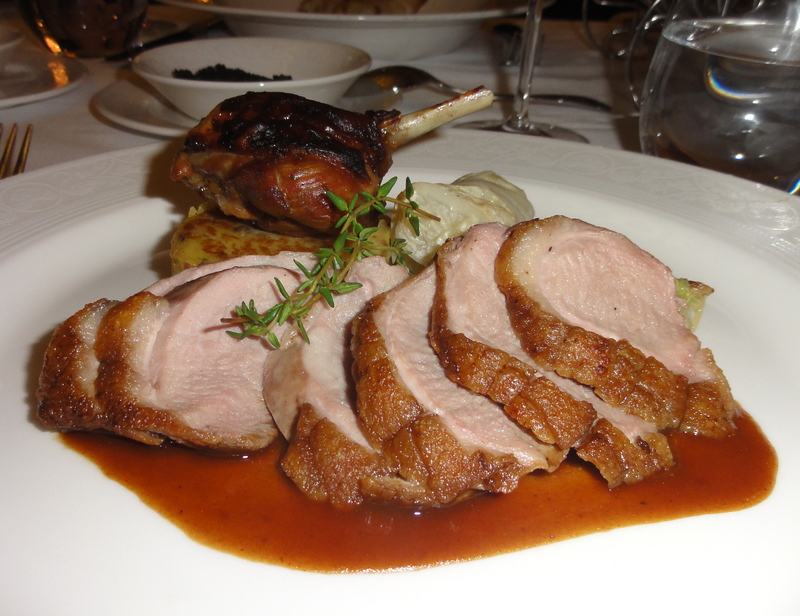 I had the Crispy Roasted Duck Breast with braised Napa Cabbage, Potato Cake, and Pomegranate Jus from Animator’s Palate. The duck was just fine, and I certainly ate it all! But it was a little overcooked, and just sort of boring. I loved the braised cabbage, though. Could have eaten a whole bowlful. 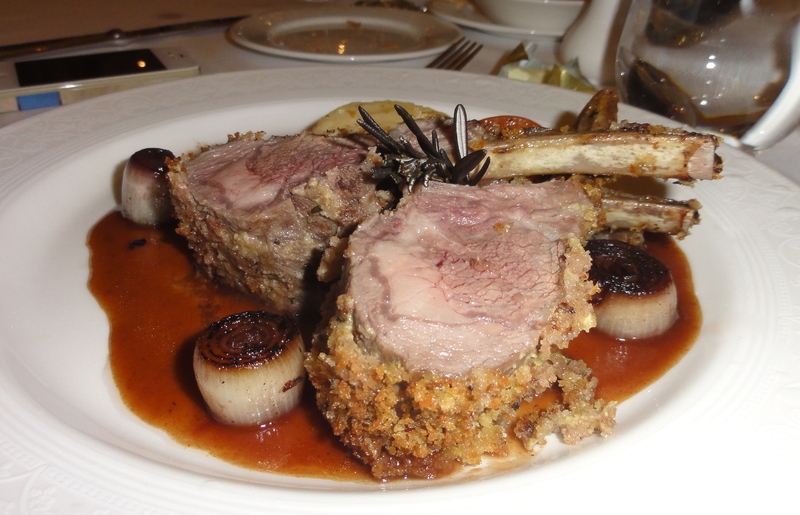 From Palo, one of the adult-only restaurants on the Fantasy (and the only one I didn’t get to tour), there was an Oregano and Parmesan Crusted Rack of Lamb with Sangiovese roasted Shallots, Olive Oil, baked Roma Tomatoes, Potato Torta and Herb Jus. My dining companion had this, and said it was absolutely delicious. Truth be told, I was sort of taking one for the team by ordering the duck, just to make sure we had a good selection of the food. But man, I really wanted this lamb. 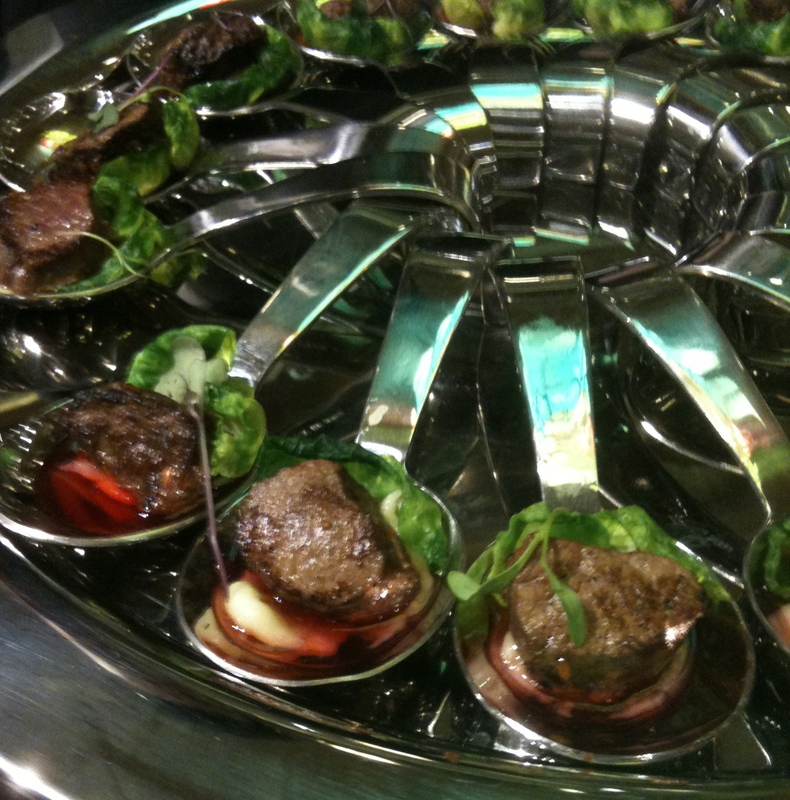 Finally, it wouldn’t be a cruise without surf and turf. 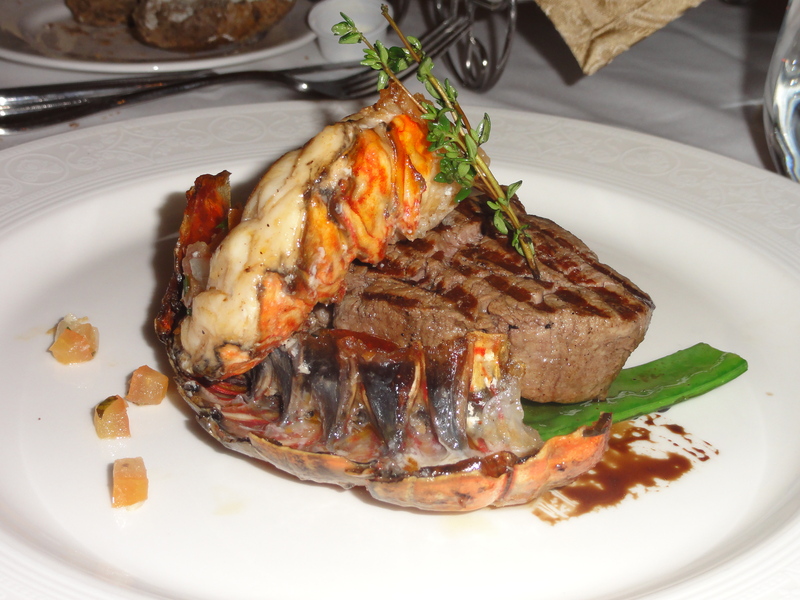 It came in the form of the Royal Court Aged Angus Grilled Beef Tenderloin and Lobster Tail with sauteed Snow Peas and Marquis Potatoes with Cognac reduction. 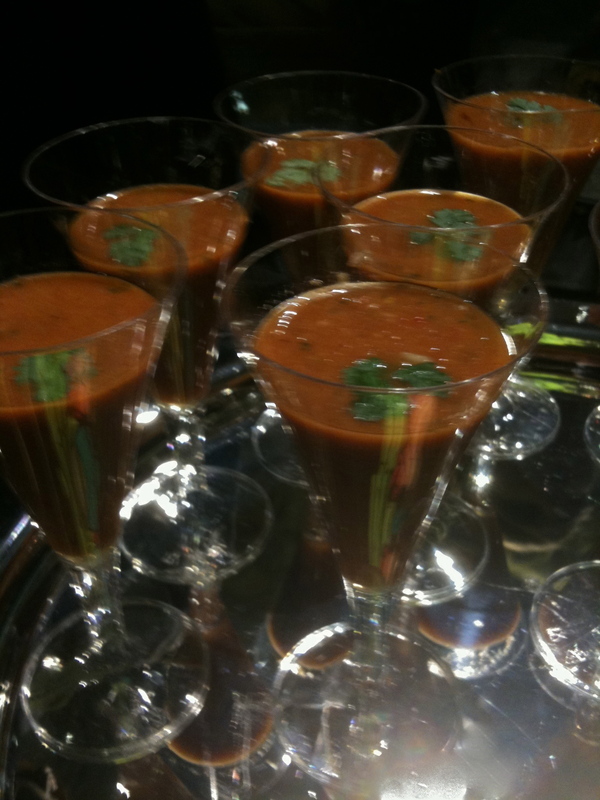 It looked divine, and my dining companions really enjoyed it. Moving on to dessert, again there were a trio from three restaurants. (1 from Animator’s Palate) Mini Lava Cake (2 from Royal Court) Tahitian Vanilla Creme Brulee and (3 from Enchanted Garden) Celebration Cake. Frankly, this was the least-successful course. 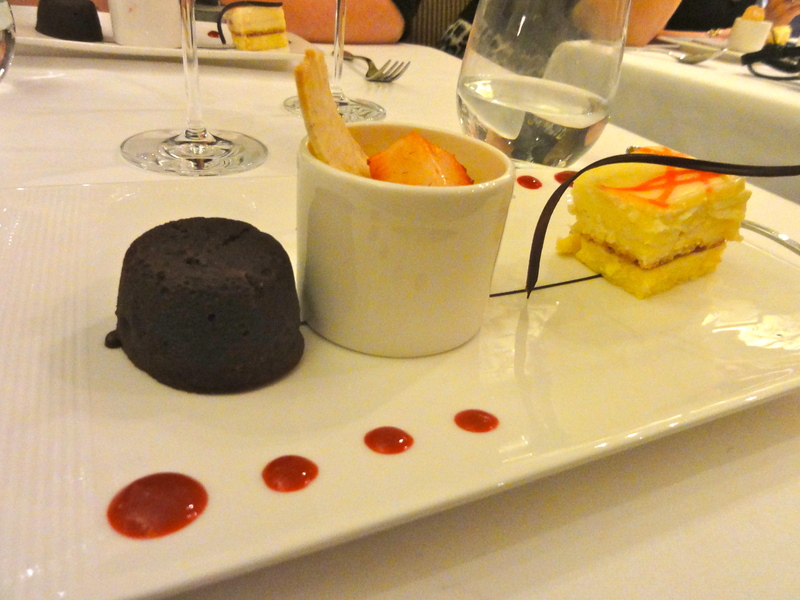 The two cakes were OK (but very boring), and the creme brulee was just not the right texture. The custard was not as soft as it should be, and the crust not as hard. It’s tough to do creme brulee properly at a large scale, particularly with such small cups. I don’t think they should have attempted it. HOWEVER, here is where the Disney Fantasy service kicked in. 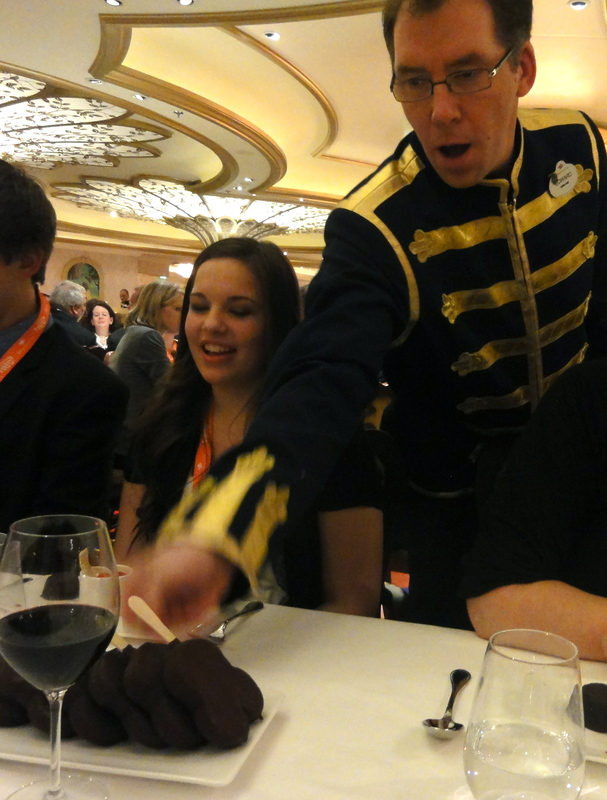 Our table of Disney experts from Magic Carpet Travel Service asked our wonderful server if they had Mickey Bars. His answer? “Of course! How many would you like?” Oh, six please! The other tables were jealous. 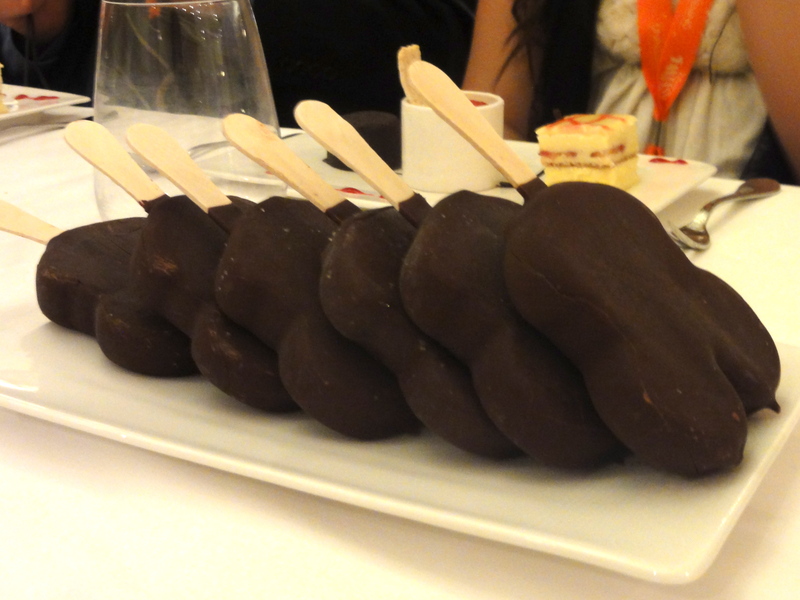 Mickey Bars suddenly began appearing at neighboring tables, to the delight of all. So were we done eating? Nah. 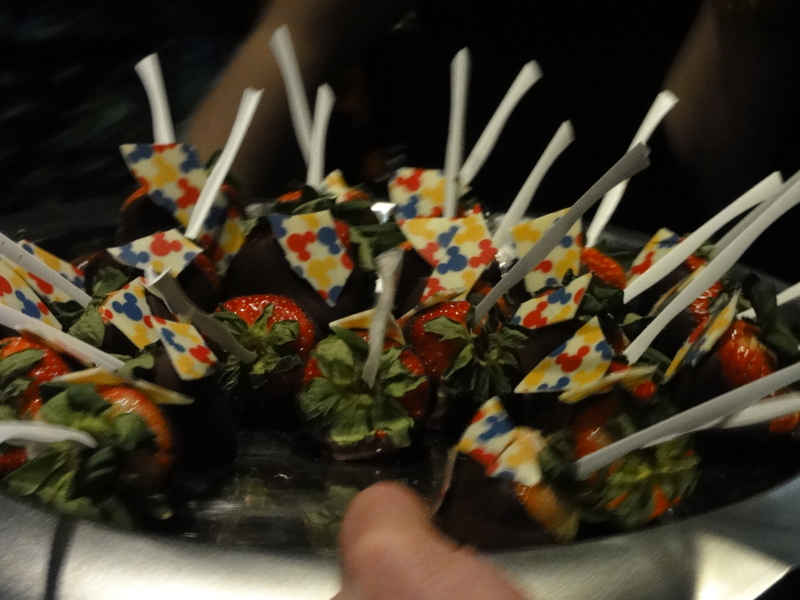 We headed to the Europa club district for the after-party, and found treats there as well. I hope these are still around for the regular cruise, and not just for the christening party. 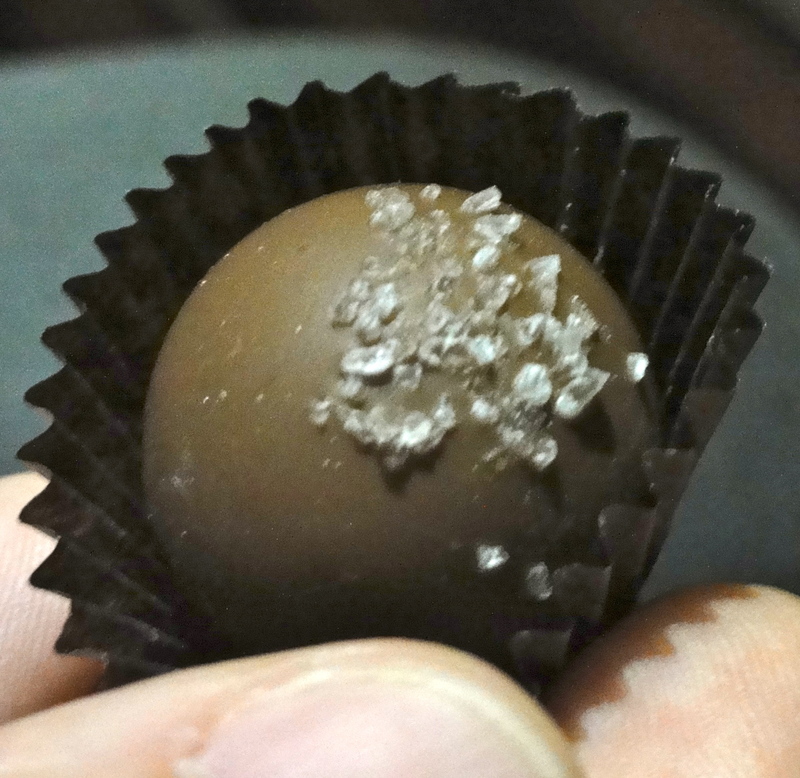 The salted caramel truffles were delish! Dawn, whoever was the model holding the Truffle? They have such lovely hands – LOL Oh man all the food was terrific! I think I gained as much from just being on the ship for one night as I’ve gain for a week long sailing. Can’t wait to report back to you about what it’s like for an actual sailing. Pictures should be on the Magic Carpet Travel Service Facebook page by Monday night March 26th.